Visoki Decani Monastery is situated in the western part of the UN administered Serbian province of Kosovo and Metohia. It was built between 1327 and 1335 by the Serbian medieval king St. Stephen of Decani and was dedicated to the Ascension of the Lord. The monastery is settled in the picturesque valley of the Bistrica river surrounded by the mountains and forests of the Prokletije mountain range It is the largest and best preserved medieval monastery in Serbia. During its turbulent history the Monastery was an important spiritual centre with developed artistic and intellectual activities. Although the monastery buildings suffered damage from the Turkish occupation, the church has been completely preserved with beautiful 14th century fresco paintings. 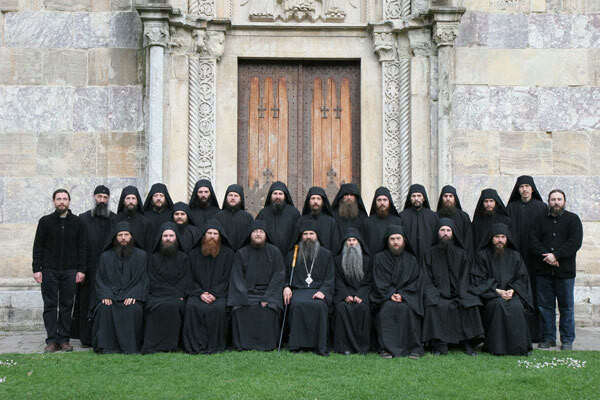 Today a young brotherhood of 30 brethren lives in the monastery continuing the centuries old tradition of the past. 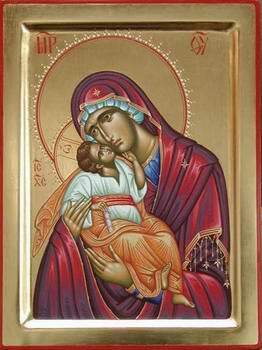 The brotherhood has developed various activities: wood carving, icon painting, book publishing and is also active in the missionary work. 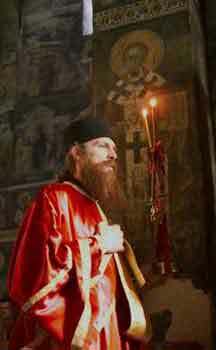 The beautiful monastic services are served according to the typicon of Mount Athos. 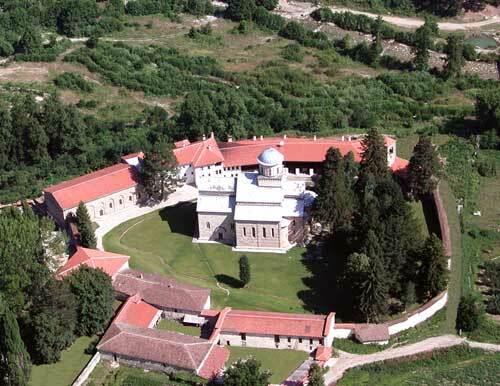 The Monastery has survived after the Kosovo war (1998-2000) and the Brotherhood today lives as an isolated Serbian Orthodox island among hostile Kosovo Albanian Moslem population. This holy site survives only thanks to the protection of Italian forces which have blocked every access to the monastery. 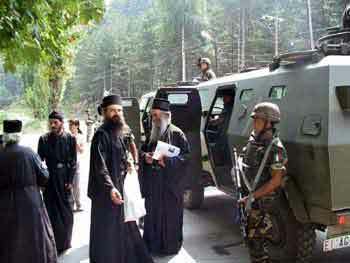 Beside all this the Monastery still attracts many international visitors from the UN Mission and KFOR. 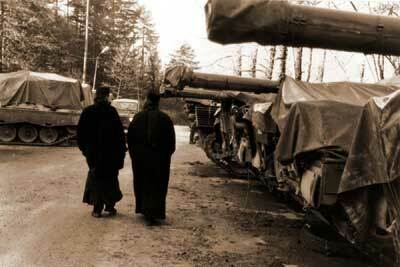 Thanks to KFOR military convoys occasionally the monastery is visited also by Serb pilgrims from Kosovo and Central Serbia. 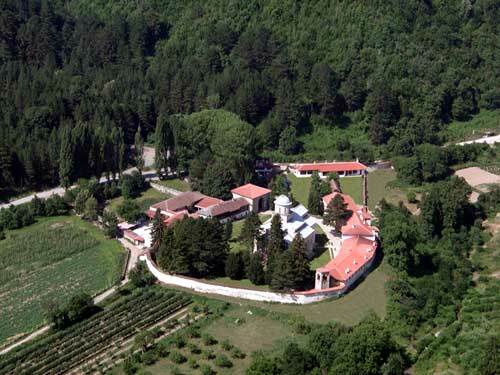 Visoki Dečani Monastery is a major Serbian Orthodox monastery, situated in Metohija, 12 km south from the town of Pec. Its cathedral is the biggest medieval church in the Balkans which contains the largest preserved monument of Byzantine fresco-painting. The monastery was established in a chestnut grove by king Stefan Dečanski in 1327. 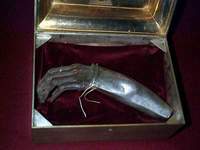 Its original founding charter is dated to 1330, however. 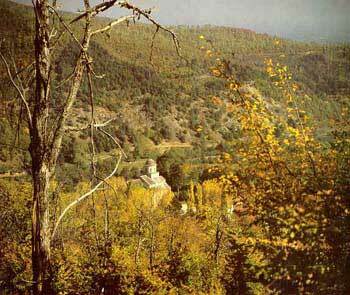 Next year the king died and was buried at the monastery, which henceforth became his popular shrine. The construction activities were continued by his son Stefan Dusan until 1335, but the wall-painting was not completed until 1350. The cathedral, dedicated to Christ Pantocrator and built from blocks of red-purple, light-yellow and onyx marble, was constructed by master-builders under the Franciscan monk Vitus of Kotor. It is distinguished from other contemporary Serbian churches by its imposing dimensions and obvious Romanesque features. 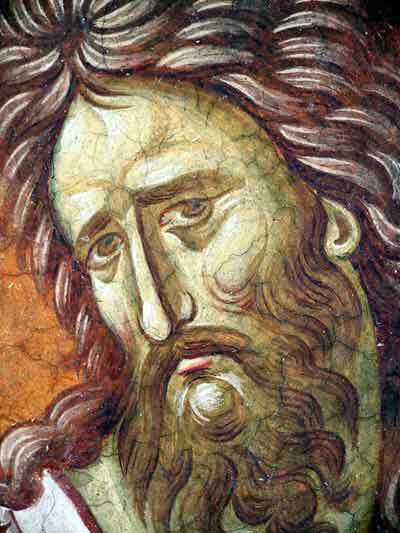 Its celebrated frescoes comprise some 1000 portraits and cover all major themes of the New Testament. The cathedral contains original 14th-century wooden iconostasis, hegumen's throne and carved sarcophagus of king Stefan. In 2004, UNESCO listed the monastery on the World Heritage List, citing its frescoes as "one of the most valued examples of the so-called Palaeologan renaissance in Byzantine painting" and "a valuable record of the life in the 14th century". UNESCO's decision to include Visoki Decani Monastery on the World Heritage List is happy and encouraging news for our entire people, as well as a great recognition for our monastery, which is a pearl of medieval Serbian Christian art. For centuries Decani with its medieval Romanic architecture and Byzantine Serbian frescoes has been the bridge that connected peoples and cultures, attesting that the sublimity, spirituality and beauty of artistic creations supercedes transient values and political conflicts. 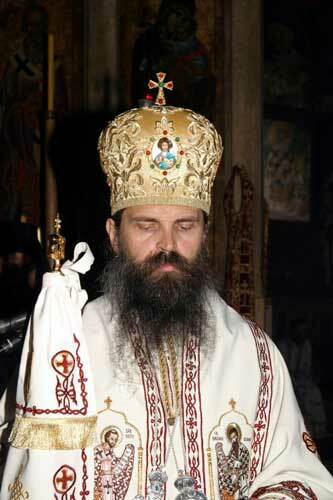 Decani continues in this role today. 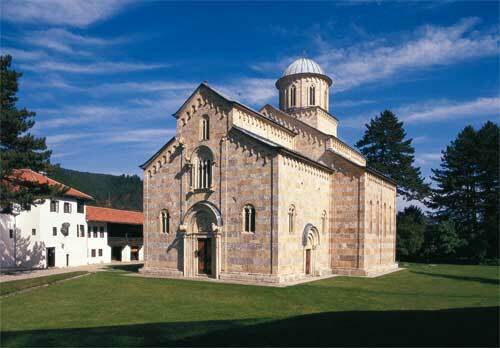 Although a Serbian Orthodox monastery built by the Holy King Stefan of Decani at the beginning of the 14th century and a part of the Serbian cultural heritage, Visoki Decani is also a part of the local cultural heritage of Kosovo and Metohija and should be the pride and responsibility of all residents of this region regardless of their ethnicity or religious affiliation. For this reason we believe that the addition of the monastery of Visoki Decani to the UNESCO World Heritage List will make it possible to better protect our holy shrine during these difficult times for future generations and to serve as a bridge to more easily connect and reconcile the people living in Kosovo and Metohija. We must all be aware that spiritual and cultural values supercede political conflicts and that they transcend narrow national and territorial boundaries. My brethren and I therefore feel it is a great honor that we have the privilege of serving God in this holy place despite the fact that we are living through what may be the most difficult times in the history of this monastery. Visoki Decani Monastery, the first cultural monument on the territory of Kosovo Province, to be inscribed in the list of UNESCO World Heritage has long been known as one of the architecturally most interesting and best preserved Serbian medieval churches in which traditions of Romanesque architecture meet artistic patterns of the Byzantine world. However, Decani Monastery paintings were often regarded as of lesser artistic value to frescoes in some other Serbian Monasteries in Raska and Kosovo regions. The most recent photographing of the entire fresco-painting of Decani Monastery has revealed a beauty of fresco painting which has so far largerly remained unnoticed in academic and iconographic circles. In this edition of the ERP KIM Info-service Newsletter we are presenting only some of the most beautiful fresco compositions which decorate walls of the Decani Monastery church. 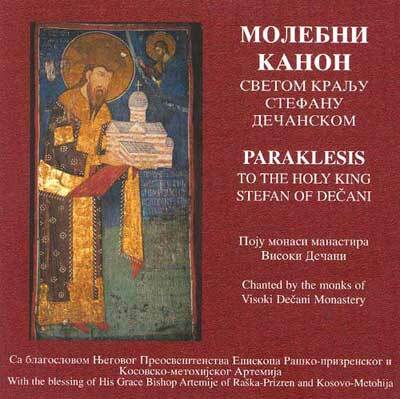 The Monastery and the NGO MNEMOSYNE from Belgrade are working currently on publishing of a large and richly illustrated Monography of the Decani Monastery which will present the artistic values of this holy shrine to the wider public. Get the know the life of the monastery from these photo galleries. Decani Monastery Old Photo Album - Old monastery photographs from the beginning of the 20th century. 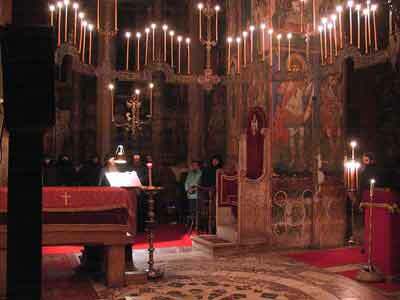 Visoki Decani monastery is well know for it great artistic beauty and value. Almost intact after 600 years the Monastery Church still survives with its 14th century frescoes and icons. 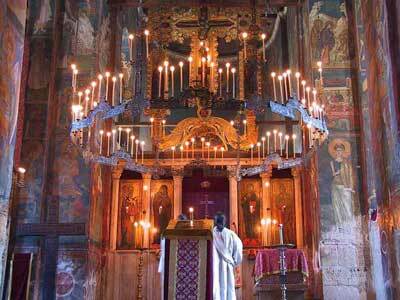 Short History of Decani Monastery The History of Decani monastery has always been very turbulent. This short essay is an attempt to present our rich history in a concise and easy readable way to our visitors. 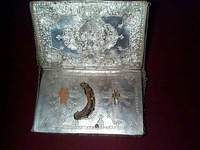 Phostos from the Feast of St. King Stefan of Decani Nov 24 2001- On this feast of St. King Stefan 4 new monks received monastic tonsure and got new monastic names: Mathew, Mark, Luke and John. 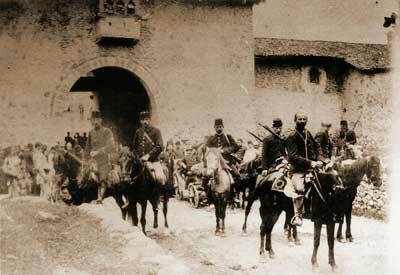 During the worst times of the civil war in Kosovo Decani monastery was a safe haven for the people of all ethnicities. 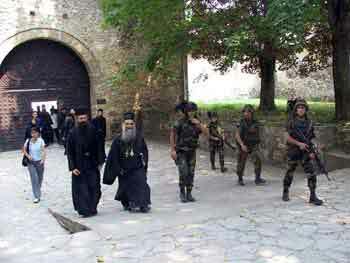 Ethnic Albanians near Pec owe their lives to the Serb Orthodox monks of the Decani monastery who shielded them from rampaging Serb paramilitaries. Post-War Life of Decani Monastery - Despite its humanitarian role during the war in which the brotherhood saved lives of many Kosovo Albanians, today's Albanian community in general still remains hostile to the monastery as well as to the Orthodox Christian Church in general. 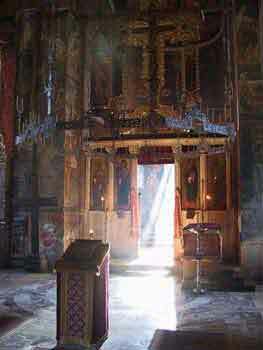 Decani monastery is exposed to various kinds of pressures, threats, hate speech and most preposterous infamation. 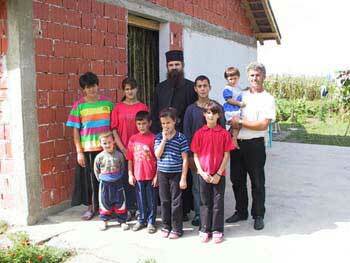 The monastery takes care of many refugee families from Decani area which temporarily reside in Central Serbia and Montenegro living in hard ecconomic conditions. Learn more about the efforts of the Decani Monastery and its friends in US to support the suffering in Kosovo with assistance of our friends and donors from all over the world.